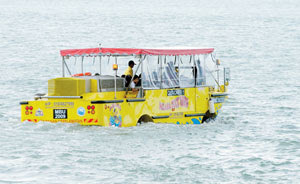 Group Tour: RM100 per boat. Sailing with instructor and ‘Jangada’ to get the taste of wind. Cruising up or down the coast line on board of the ‘Mac’. 6 Persons maximum. Passenger have the choice between seeing Melaka from the sea side, following the scenic coast of Melaka to the north, or to get close to the ocean-going freighters on the world’s most busy straits. The trip includes soft drinks and snacks. Duration: 4 hrs. Tour start on appointment. Start in the morning and head for an island of customer choice: a lone island with a beach or Pulau Besar with its local history and tales. Refreshments and picknick are provided. Will sail back to arrive towards sunset. 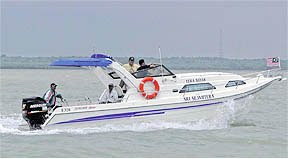 A pick-up in Melaka town or Umbai can be arranged, in case customer want extended time on the island. If customer are more interested in the sailing itself, cruise will start at Explorer. Romantic evening trip. The Mac provides the platform for a relaxed excursion when the sun goes down. Drinks and snacks round up a special evening. 2 hours or more. A Must-have for honeymooners. Enjoy a journey to Pulau Besar under sails. Discover the island, its people, its history, its cave and stay overnight; in a lodge or on board of the Mac. Next day have a relaxed breakfast and have a swim at the beach or start to a slope ‘outbound’ which will bring close to the ocean traffic with its big freighters. Starting in the morning, will be back next day in the evening. Snacks and soft drinks on board will be provided. Generally based at Seafarer Explorer, can arrange for different pick-up points. Cruise depend on weather conditions.